This Unique Pool Wheelchair is built to ensure your mobility in aquatic environments is made super easy. It is created with amazing features that not only facilitate movement in aquatic environments but also makes transfers comfortable, safe and easy. The MAC Mobile Aquatic Pool Wheelchair is best used at facilities that utilize a ramp, have a zero-depth entry or has a movable floor. Sportaid offers you this incredible chair that is a must-have for anyone who loves a splash at the pool. I will let you in on the features of this fantastic chair next. 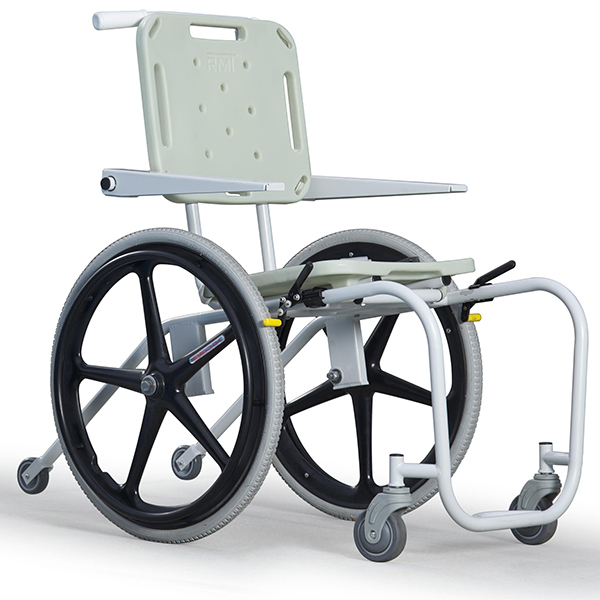 The rear wheels are built to provide utmost stability to the chair in the water. You do not need to worry about toppling over in the water, your stability is guaranteed. This chair has an elegant eye-catching stainless steel frame. The frame’s durability is enhanced by the powder coating that inhibits corrosion and rusting even with regular use in water. Your security during transfers both on and off the chair is assured; this is made possible by the flip-up armrests that ensure zero chances of accidents during transfers. The uni-body frame further ensures that your chair lasts long. The frame is sturdy and gives the wheelchair long life. With a seat width of 18″ and 300 lbs weight capacity, the chair is an ideal choice for individuals of a fairly large size and weight comfortably. Using the chair makes transfers easy and safe for you. The roto-molded plastic seat offers you a stable transfer support for transfers while the swing away arms give enough room to successfully get in or out of the chair. The material used to make this chair is non-corrosive, thus you do not need to worry about the chair getting rust. Rear stabilizer wheels make it hard for you to pitch forward or backwards when moving on a ramp. The wheelchair does not meet the ADA compliance requirements, but it is still a fabulous wheelchair for your pool activities. Open up your aquatic fun with this elegant wheelchair available at Sportaid at a reasonable price. Check out their money-saving discount offers and while at it experience excellent customer care services they offer to their customers for at Sportaid it is all about the customer.